﻿Keep your eyes out after New Year's for a new addition to the Sizzlin' CurveWear family! We are working hard on a line of bags that are fun and functional, inspired by the life of a nanny! These bags will range from a cute handbag to tote bags suitable for a day at the beach or an overnight trip. 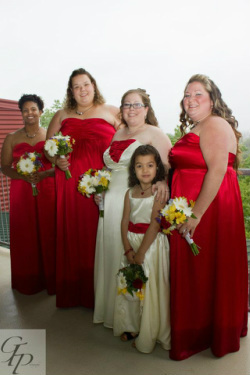 Check out one of Sara's best friend's weddings! Sizzlin' CurveWear outfitted the entire bridal party, including bride Becky Searles Cates, bridesmaids Bethany, Gloria and Sara, flower girl Izzie, and ties for all the groomsmen, groom, and ring bearer! The wedding was a blast in spite of the rain, and is an event all involved will remember forever! Thank you for letting Sizzlin' CurveWear be a big part of your day!!! So, after many techincal issues, the new pictures are in the process of being uploaded! A HUGE thank you goes out to Acela, Ashley, Charisse, Jill, Kelley, Natalia, Nicole, Nivea, Tara, Tiffany, and Yanira, who all came out to the chilly shoot to make SCW look fabulous!!! Look for some new products and order today!!! A special thank you also goes out to David Sheppard-Brick(www.photosbydsb.com) and Anthony J. Capobianco, my AWESOME photographers. Thank you for all your hard work! The Photo Shoot on May 22 was AWESOME! The weather wasn't so great, but the rain held off and we were only a little cold! The pictures came out awesome, and after editing, we will be posting all the new products (and new pictures of some popular products) for your shopping enjoyment! A special thank you goes out to the 11 fabulous models and 2 incredible photographers who put in a tremendous effort to make the chilly photo shoot day a huge success! Well, the photo shoot is upon us! We are very excited to have many gorgeous ladies lined up for the shoot, as well as 2 phenomenal photographers. After the shoot, we will let you in on who all these fabulous people are!!! In the meantime, keep your eyes peeled for the newest products in the line to appear in their respective categories!!! Sizzlin' CurveWear is gearing up for another fabulous photo shoot. If you live in the Boston area and would like to model for SCW, please contact Sara at sizzlincurvewearbysara@hotmail.com! We will be photographing new designs and introducing them to the world! More details to come, so stay tuned!!! Sizzlin' CurveWear made its White House debut on December 3, 2010! 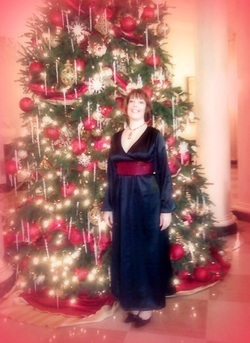 Sara was lucky enough to be the designer for an elegant, sophisticated gown for Ms. Cinzi Lavin, as she made her own White House debut, performing musical entertainment for a White House open house for the holidays. Sara is very honored and humbled that Ms. Lavin chose to wear one of her designs (a custom creation) for her big performance. Thank you Cinzi!
" I have to say, Sara is not only the greatest fashion designer I've ever met but she's one of the most inspiring individuals I've ever had the privilege of knowing. She's the kind of designer everyone wishes they had working on their team. She makes me look sensational and she makes me laugh!" Sizzlin' CurveWear participated in the Celebrating Women's Fashion Show at the Breezeway Pub in Roxbury during Boston Fashion Week 2010, organized by Fabiola Brunache of www.LookingFabz.com, a fellow women's clothing designer. I want to take a moment to thank my incredible models, Angela M., Becky S., Tara S., Lori R., Fabiola B., Ijey U., DeAnna S., Jonina B., and Michela P. Also a great big thank you to my photographer, Michela P.!!! Without you fabulous ladies, I wouldn't have the priceless images of the garments that you make look so great!